TS SSA MISCs, DEOs, IERTs/IERPs Posts Recruitment 2017: Filling up MIS Coordinator, Data Entry Operator and IERT vacancies in Telangana State for 2017-2018. MIS Coordinator, Data Entry Operator and IERT Posts Recruitment. 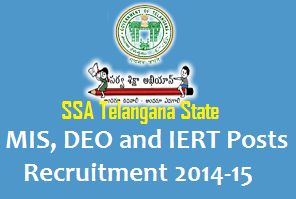 SSA Telangana State MIS, DEO and IERT Posts Recruitment. SSA Telangana Jobs. SSA Telangaana Recruitments: The Commissioner and Director of School Education and The State Project Director of Sarva Shiksha Abhiyan, Telangana State has issued a proceeding to all the Project Officers of SSA, Collectors and District Magistrate and District Educational Officers in the Telangana State on Today onwards. In this connection this proceedings for Filling up of vacancies of the MIS Coordinator, Data Entry Operator and Inclusive Education Resource Teachers on contract basis during the year 2014-2015. In this regarding certain instructions have been issued to all the above said officials and related guidelines and forms have been sent to the concerned district officials. This proceedings details are provided here. Subject: Filling up of vacancies of the MIS Coordinator, Data Entry Operator and Inclusive Education Resource Teachers on contract basis during the year 2014-2015 and Instructions. 1. C and DSE and SPD has informed to all the Project Officers, SSA are invited to the above subject cited that some of the District Collectors and Projecr Officers are requested to permit to fill the available vacancies on contract basis in MIS Co-ordinator, Data Entry Operator at Mandal Resource Centres and Inclusive Education Resource Teachers in Telangana State so that the work in MRCs and IERCenters is carried out well. 2. In this regarding C&DSE and SPD have informed to take action to fill up the vacancies is herewith accorded permission to fill up the vacancies of MIS Coordinator, Data Entry Operator and TER Teachers in Telangana State is herewith accorded permission to fill up with a fresh notification. Further they may be requested to follow the local candidature. 3. A separate guidelines for MIS, DEO, IERTs and contract forms has been issued by the SSA Officials to follow the procedure to fill up the vacancies in the above mentioned posts in the Telangana State during the year 2014-2015. The entire process may be completed by 10.09.2014 and District Officials should submit a compliance report to this office. Recruitment Guidelines, Qualifications, Selection Process as follows: The following guidelines shall be followed scrupulously while engaging the services of MIS Coordinators and Data Entry Operators. iv) Project Officer RVM (SSA) - Member Convener. (iii) Overseeing the entire process of selection of candidates. Mandal shall be the unit of appointment in respect of MIS Coordinators and Data Entry Operators. Candidates belonging to a particular mandaI are only eligible to apply for MIS Coordinator's and Data Entry Operators post in that mandal. In case of non availability of eligible candidates in a unit in a particular reserved category, candidates from other community in the same unit shall be considered. If eligible candidates are not available in a particular unit, candidates from outside unit shall be considered in the same reserved category. Rule of reservation shall be followed as per the norms in vogue to all the posts. It will be prepared by the Project Officer at district level by taking district as a unit. Candidates should have Minimum 18 Years and Maximum 39 Years years of age as on 01.07.2014. However, in case of SC/ST/BC candidates the maximum age limit shall be44 years and in case of physically challenged candidates the maximum age limit shall be 49 years. Merit list shall be prepared mandal-wise for MIS Coordinator and Data Entry Operators as the mandal is the unit of appointment. Data Entry Operators: Rs.11,000- per month. (i) Aggregate marks of graduation course mentioned under qualification (50 marks). (ii) Skill tests for MIS Coordinator and Data Entry Operator for 50 marks. Selection shall be made on the basis of Merit for Total 100 Marks. Maintenance of all types of Mandal level statistical data including planning and DISE Maintenance of Web portal data. Monitoring the status of working condition of computers in schools. Any work assigned by MandaI Education Officer. Analysis of DISE and other data. Thanks for sharing job opening. Keep it up.